Developed with researchers from the USC School of Cinematic Arts, the folded paper device, constructed for less than five dollars, is one of a growing number of do-it-yourself projects that are decreasing the overhead and hardware required for fully immersive virtual reality experiences. These low-cost, lightweight systems can be used to create portable virtual reality applications for training, education, health and fitness, entertainment and more. 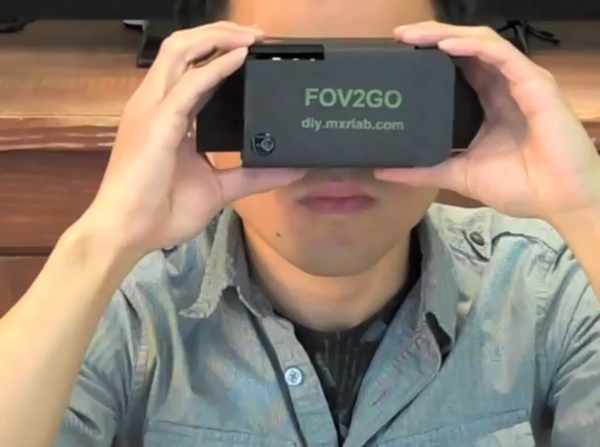 The FOV2GO was distributed at the ICT-hosted workshop on Off-The-Shelf Virtual Reality and will also be available at the ICT booth during the IEEE Virtual Reality Conference. Recipients can fold the viewer together, download a simple demo app and then slip in their smartphone into the viewer for a portable immersive 3-D experience. Links will be provided to software libraries and packages to help develop immersive VR packages. The project and weekend workshop were inspired by the late Randy Pauch’s 1991 paper, “Virtual Reality on Five Dollars a Day” in which he described a virtual reality system costing $5000 – substantially less expensive than much of the immersive technology being used at the time. More than twenty years later, inexpensive sensing and 3-D display technology is a reality. Other devices demonstrated at the workshop included depth cameras for hand and touch interaction and fibrotactile gloves for virtual exploration. The workshop keynote address by Evan Suma, a postdoctoral researcher in the MxR Lab covered tools for using natural gestures and movements as opposed to traditional keyboards and mouse clicks on a computer. Examples of the lab’s work include FAAST, or Flexible Action and Articulated Skeleton Toolkit and their popular videos on using gestures to power World of Warcraft, Second Life and Gmail Motion’s April Fools Prank. David Krum, who is co-director of the Mixed Reality Lab, will also present a demonstration of Virtual Realty To Go at the IEEE conference. THE MINUS LAB: Tales from the Minus Lab, Alex Beachum, Sarah Scialli, Steve Wenzke, David Young, Robyn Tong Gray.